I design and produce distinctive unique, often colourful, figurative and abstract handmade tiles, hand decorated tiles and tile panels for public and private interior walls. Abstract ‘Grass’ design, 6″ x 3″tiles.Try turned horizontal. You won’t find my tiles in tile shops, or DIY stores; they are not a quick fix and are not mass produced, neither are they instant art, or a standard range. This is a chance to commission something new within an ancient tradition from an experienced and skilled tile maker with a national reputation. 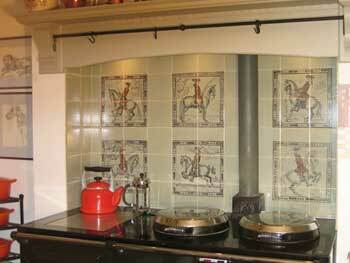 Pewter coloured tin glazed tiles for an Aga recess.- Historic dressage horses. I make different types of wall tiles. 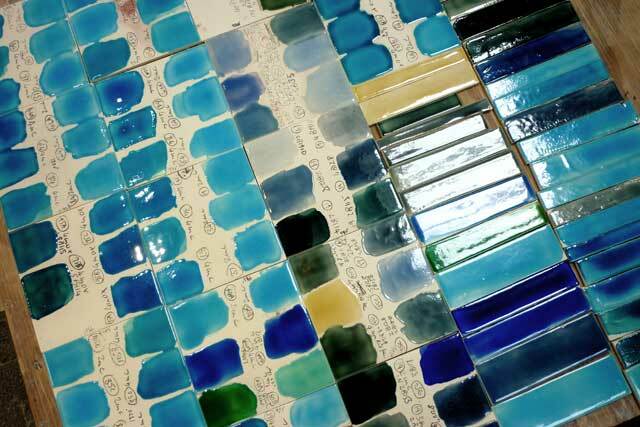 All sorts of things are possible, large or small; from small tile panels to a wall of tiles. Bespoke hand made tiles and hand decorated tiles, tile panels, bathroom tiles, kitchen tiles, swimming pool surrounds, jacuzzi surrounds, wet room tiles, splash backs, dado tiles, shower tiles, commemorative panels, border tiles. Why not have a look at some of my WORK IN PROGRESS . 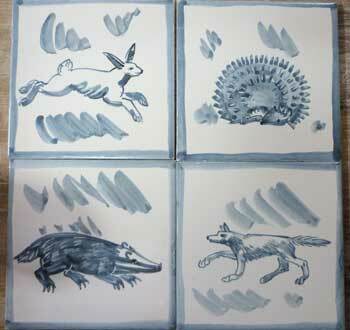 Single blue and white tin glaze ‘wild life’ tiles with a border. For most of the drawn tile projects I use as a base unglazed standard British dust pressed earthenware tiles.
. Tiles can be cut as part of the design to fit non standard spaces. A batch of alkali crackle glaze tests on the work bench. 153mm. sq. [6″ sq]. x 6mm. [1/4″] thick (This is the most useful and practical size). 99mm sq. [ 3 7/8″ sq]. x 6mm [1/4″] thick (For simple or plain tiles only! ‘Brick’ shaped tiles, sizes – eg. 153mm. x 76mm. [3″ x 6″] , or 203mm. x 102mm. [4″ x 8″] . (Best for plain colours only. Allow for recommended spacing between tiles of approx 3mm. [1/8″]. Please see the TILE PRICES PAGE for more information about prices and the ORDERING TILES PAGE for more information about ordering. These handmade tiles can be made in clays of different colours in a variety of sizes and can be used to create a softer effect than standard tiles with a variation from tile to tile which enhances their organic quality. [See more on techniques pages]. Use for a focal point, a splash back, or border with other tiles. Please be patient, they can be beautiful, but hand making clay tiles is definitely part of the ‘SLOW’ movement – they can’t be hurried, or they will crack! Maximum physically practical size for these clay tiles usually 6″. 153mm sq. 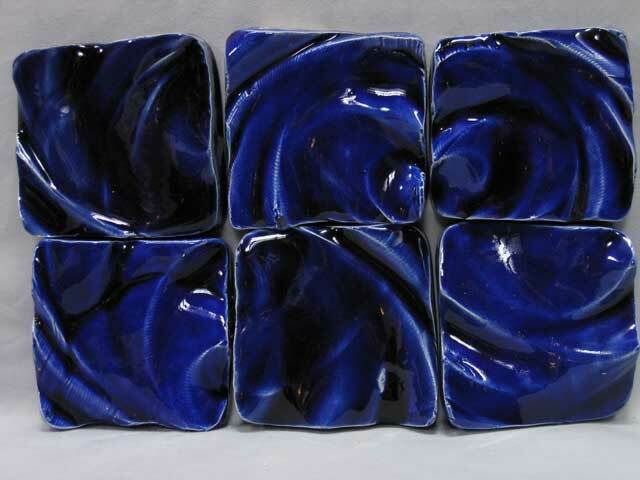 Decorative small handmade ‘wavy’ tiles. N.B. All these wall tiles are relatively low fired earthenware which enables me to produce the colours I do, but it also means they are not frost proof! It is well worth visiting the studio to see the real thing. -Individual pieces of work can be seen and bought at the studio which is open most non holiday week days 10.30-4.30p.m. Please phone to check I’m in!